What If You Can't Pay the Taxes You Owe? You've just finished preparing your tax return and notice that you owe Uncle Sam a hefty sum, but you can’t afford to pay it. Are you going to jail? Probably not. The realization that you can’t afford to pay your taxes can make you feel uneasy, but don’t worry. 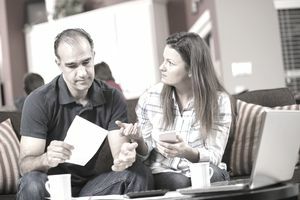 There are some things you can do to remedy the situation and avoid landing in hot water with the IRS. Even if you don’t have enough money to pay the taxes due, you still need to send in your return by the filing deadline. The IRS assesses two types of tax penalties: one for filing late and one for failing to pay. For the 2018 tax year, the penalty for filing late is 5% of your taxes owed for each month your return is late, up to a maximum of 25%. The late payment penalty, by comparison, is just 0.5% of the unpaid taxes due. If you can't pay your tax bill in full on time, you'll still garner a much lower penalty than you would by waiting to file your return. So bottom line, get your return in by the filing deadline if not before. And pay as much of your taxes owed as you can when you file. Even if you can't pay in full, paying something towards your balance due can reduce the amount of interest and penalties you'll later. Whether you owe $100 or $10,000, the first thing you should do is try to find possible sources to obtain the money you need to pay. For example, you may consider tapping the equity in your home, using a credit card to pay your taxes, digging into your savings, getting a personal loan, borrowing from friends and family, or cashing out paid time off at work. A more extreme option is to pull money out of your IRA or other retirement savings; however, this can trigger its own tax penalties, so it's best to view this as the option of last resort. If you're considering a loan or credit card to pay your tax bill, remember to weigh the interest rate and fees in the balance. If you can repay a loan or credit card fairly quickly, or use a credit card with a 0% APR, the cost may be minimal. But if you owe a larger tax bill, the interest can add up very quickly. Also, be aware that the IRS charges processing fees for paying income taxes with a credit card, which can increase your total cost. While it's always best to pay the taxes you owe in full and on time, there are scenarios when all you may need to pay is to get your next paycheck. In that case, you could file your return and accept the late payment penalty. As long as you filed your taxes on time, the IRS will send you a letter in the mail stating how much you owe plus any additional interest or penalties are due. The downside is that your tax bill will be lingering over your head a bit longer and what you owe will accrue penalties and interest until you pay. The upside, however, is that the interest you pay will be relatively low compared to financing the money with another source. Of course, this certainly shouldn’t be a long-term solution, and your goal should be to pay the IRS as soon as possible, since the longer you wait the more the penalties and interest can add up. Wait too long to pay and the IRS may take action against you to place a lien against your property or garnish your wages or bank account. The government, just like anyone else, would rather get the money over a period of time as opposed to not at all, so they do have an installment plan available when you can’t pay in full. To request an installment plan, you should use Form 9465. You can even set this plan up to do a direct debit from a bank account to make the process easier. A short-term installment agreement can be established if you think you can pay your tax bill in full in 120 days or less; a long-term plan is also available if you need more than 120 days to pay. There's a fee to apply for an installment agreement. Individuals can apply online for a short-term payment plan if they owe less than $100,000 in combined tax, penalties, and interest. Long-term plans are available if you owe $50,000 or less. If your tax owed is higher, you'll have to mail in your Form 9465 to apply. The IRS prefers that payments be made via direct debit from your bank account. Penalties and interest continue to accrue until your balance is paid in full. If you can’t find the money and you can’t get an installment plan, there's one final option available: an Offer in Compromise. Keep in mind, this is only for extreme circumstances. If you request an offer in compromise, you can offer to make either a lump-sum payment or fixed payments over a short period of time. The IRS agrees to accept less than the full amount owed to satisfy your tax obligation. This process requires you submit a complete personal financial statement and an application fee of $150 in addition to Form 656. These offers are evaluated on a case-by-case basis and you may or may not be approved. If the IRS determines from the information you've provided that you're unable to pay the amount in full, the offer may be accepted. Once it's accepted, you agree to pay your taxes in full and on time for a period of five years after the offer is established. Paying the taxes you owe is very important, so it's vital that you explore all of your options instead of panicking. Above all, file your return on time to avoid the late filing penalty. Then take the time to consider how realistic it is for you to pay your taxes and what avenues are available.